The Internet of Things 2.0 is emerging and it will bring an end to the technology push that has characterized efforts to create value with the IoT up to now. The IoT 2.0 will be defined by the "why" of new offerings and lead by those companies who lead with a design-thinking approach to their product developments. Paul Metaxos and I recently published an article in Harvard Business Review on the importance of design in creating value in the next phase of the Internet of things (IoT) — IoT 2.0. IoT 2.0 is the natural next step in the technology adoption curve and will bring in a new wave of IoT-facilitated solutions that will demonstrate a higher rate of adoption and return on investment. The IoT can be harder than other technology adoption progressions because of the sheer mass and pervasive nature of the technology ecosystem if companies do not adapt. 40 years of Moore’s Law combined with Marc Andreessen’s “software is eating the world” has made every technical challenge viable from a cost point and accelerated the pace at which new features and offerings become available. Just follow Kickstarter for a couple of months to see how easy and cheap it is to create new offerings. But cheap-and-easy for developers is not the key to rapid technology adoption nor creating revenue. IoT as a technology has been in progress for over 5 years — it first showed up on the Gartner Hype Cycle in 2011. I, like many others who have worked in the connected product and mobile communications space, can say “IoT is just another name for what we have been doing since the early 1990s” and this is true from an existence point of view. But as a specifically identified, named, and tracked technology suite IoT has been around for about 5 years. 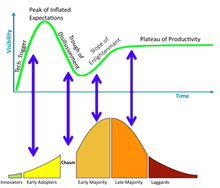 The 2016 Hype Curve has IoT falling into the dreaded Trough of Disillusionment and squarely in Geoffrey Moore’s “Chasm.” Recent events like the Nest Revolv sudden end-of-life decision and SmartThings home hub security hack videos have helped validate IoT’s position on the Curve. Yes, some segments of the market have moved to real adoption but these segments are those of the aforementioned more mature M2M applications like factory automation, building controls, and fleet management who can say, as Hitachi recently did, that they have been practicing IoT integration for 15-25 years. These M2M/IoT stalwarts like Hitachi have the ability to reclassify “$5.4 billion of revenue in 2015” with the stroke of pen to demonstrate adoption in the IoT. But the majority of new IoT entrants focused on the holy grail of MRR (monthly recurring revenue) from cloud delivered service subscriptions have not met investor expectations and, as Bill Gurley recently posted, are now advised to consider down rounds. My poster child for IoT 1.0 is the Quirky Egg Minder. I had been following Quirky for a while because of their interesting approach to empowered groupthink and innovation. But when I first read about the Egg Minder I thought to myself “When was the last time I cracked open a bad egg?” I was over 50 years old, not saying how much over, and my answer was “Never.” Maybe I was not in the target market segment, but given that the product was headed to Home Depot and I visit them once a week on average, it sure seemed like I was supposed to need this product. A wireless, connected, non-incubating egg monitor? Why? It’s never good when a consumer looks at a product and asks “Why?” Marketing teams are supposed to ask why: Why will customers buy this product? or Why will this product change people’s lives? Investors are supposed to ask why: Why will customers choose this product over all others to solve their problem? or Why does the world need this product now more than any other? The problem with technology adoption curves is that they focus attention on the technology but are actually a measure not of the technology, but of the skills of the users of the technology. Users of technology, the innovators if you will, succeed not by how skilled they are in the technology itself but by how skilled they are in uncovering and solving user problems that matter. Up until now the users of IoT technology can be characterized as technology-centric, often horizontal companies looking to push IoT solutions into the market. IoT 2.0 will be characterized by successes created by teams that clearly understand why they are building the new product. Both offerings and business models change when companies focus on why they are developing a new product as opposed to what it has. Asking “why” is going to change what we see in the IoT 2.0 solutions in three ways. 1. Companies will leverage market segmentation. When development teams start focusing on user problems they find that diversity is not just an HR policy, it’s a fact of buying behavior. Pushing technology is like fishing with live bait — you throw out what you have and see what bites. But fishing pros not only have specific lures for specific fish, they have specific sizes, colors, and presentations. IoT 2.0 is going to similar and all about segmenting markets to find the important problems that matter to that user segment and then solving that problem with specific, tailored solutions. Look not for Swiss Army knife solutions but solutions that can be efficiently adapted to the needs of each segment to meet needs and capture that value. 2. Customer experiences will be simpler. Einstein said “make everything as simple as possible and no simpler.” He was referring to the models and mathematics that physicists were developing to understand the physical world. Ludwig Mies van der Rohe advocated design simplicity when he said “less is more.” When a product developer targets a specific user segment that fact frees them to remove everything else that gets in the way or of distracts from the user’s true need. The chamberlain garage door opener succeeds in the home automation market because Chamberlain targeted a known segment with a simple solution to a real problem. They didn’t add “we can turn on your furnace when you open the garage door” or “we can play Welcome back (Mr. Kotter)” as you pull into the garage. Simple solutions with simple experiences increase adoption and will be the norm in IoT 2.0. 3. Retrofit and after-market solutions will drive revenue. When companies focus on their customers, existing and future, they discover unmet needs for both. After they develop an solution do they then tell their existing loyal customers, “Sorry, you need to buy this new [appliance here] to get our new solution?” That can work if the product is a consumable like laundry soap or tooth paste but electronics goods are supposed to last 3–10 years, even longer in the industrial space. IoT 2.0 is going to see OEMs (Original Equipment Manufacturers) find ways to solve new problems and generate new revenue from the installed base. I worked with one company who was adding new connected features to the next generation of piece of capital equipment and they were doing so based on a potential new customer of 500 units. When I asked them how many machines they had sold with the necessary sensors field they answered “over 50,000.” The IoT technology ecosystem is full of both hardware and software components that can be integrated with existing products to create new value. The companies that embrace retrofitting the installed base will accelerate customer adoption while improving the stickiness of the customer relationship. The good news is that these characteristics are typical of strong design thinking and are time tested attributes of successful businesses. The challenge is that technology companies often undervalue the role both design and marketing play in finding the right problems to solve. IoT 1.0 has provided many examples of the limitations of this approach. Scott Nelson is Chief Product Officer and VP of Product at Digi international. For over 25 years he has led product development and entrepreneurial business growth as both a technology and business leader.